A partnership between EMTA, the Erie Downtown Partnership, and Erie Arts & Culture wants to get you in the loop -- the new "Cultural Loop," to be exact. A press conference to be held at the Intermodal Transportation Center at 2 p.m. Friday, Dec. 12 will introduce the new park-and-ride trolley service, which launches Saturday, Dec. 13. 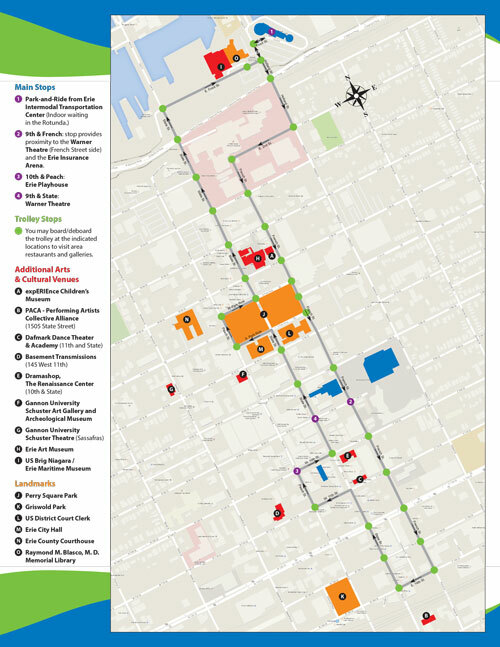 The new service, which will run from 5 to 11 p.m. Saturday evenings during the pilot program in half-hour increments, will be free in order to "encourage residents and visitors to spend more time downtown in our cultural district," according to a press release issued by Erie Arts & Culture. "As programming expands, we need to provide a variety of parking and transportation options to make it easier for our audiences to access venues," explains Amanda Brown Sissem, executive director of Erie Arts & Culture in the release. Park-and-ride services offered in the summer have been successful in promoting participation in summertime activities along the Bayfront -- and that's when temperatures aren't in the single digits and there's not a foot of snow to sloosh through -- so it seems a natural fit to offer similar services since cultural events and entertainment in the Gem City don't take a season off. Plus, according to Sissem, season ticket holders and subscribers have been vocal in wanting similar services year-round. While services will begin as a Saturday-only option, the release indicated that the opportunity for expansion exists -- as interest grows. That is, if enough people utilize the service and demonstrate and request a need for more, it wouldn't be out of the question to see additional nights added. Park your car -- for free -- at the Intermodal Center (indoor waiting will be available -- for free -- in the Rotunda). And then hop aboard a shuttle -- for free, which depart every half-an-hour -- to head to various destinatons along the route (which is where you can re-board a shuttle -- for free -- to head back when your night's found its end), which snakes its way south on French Street to 14th Street, turns left to head west on 14th to State Street, makes a right to go north to 11th Street, heads westward to Peach Street, from Peach to 10th Street, from 10th back to state, from State to Perry Square farther north, loops around the Square to again head north on State to return to the Intermodal. Confusing? It's really not, and there's a map (below) to help you out, too. There, you'll see the four main stops, plus trolley stops along the way (you can hop on one of those to branch out in your cultural exploration to the additional arts and culture venues and attractions noted). "This new service will be a great addition to our downtown," said John Buchna, CEO of the Erie Downtown Partnership, in the release. "We'll be able to provide safe, timely transportation to those who support arts and culture programs by linking them to venues and other establishments. "Arts and cultural programs are key to our downtown," Buchna added. Yes -- emphatic yes -- they are, John. Arts and cultural programs continue to be what attract people to particular areas. Without a reason -- an event, some entertainment, something, anything to occupy our time -- people are more likely to opt for something else, like staying home just to stare at glowing rectanges, or worse, heading to other cities -- possibly for good. That opting for something else means the cool things happening in downtown Erie -- from music, to theater, to dance, to food and drink, to poetry, to art -- may just pack up and go elsewhere, too. 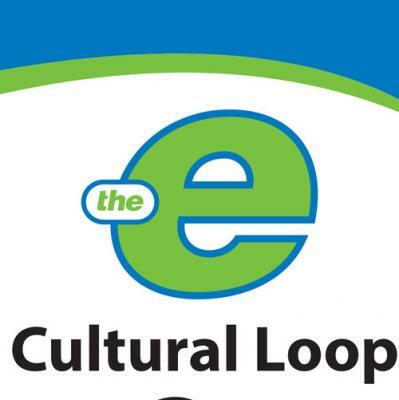 So if you want your culture to remain -- and thrive and evolution -- it's time to get in the loop, Erie. Ben Speggen believes that two things are key to smart urban development: Access to public transportation and a vibrant arts and culture scene, so this announcement has him pretty damn excited. If you're excited about it, too, you can visit ErieArtsAndCulture.org/Events or check routes and fares at the EMTA website, EMTAErie.com. If you want to talk him about downtown development, transportation, or arts & culture, email him at bSpeggen@ErieReader.com and follow him on Twitter @ERBenSpeggen.